On Saturday, December 10th, Ric O'Barry, star of the Academy Award-winning documentary film The Cove, joined Filmmakers Louie Psihoyos and Fisher Stevens, Actor-Comedian John Leguizamo and Race Car Driver Leilani Munter to take part in a momentous lighting ceremony at the Empire State Building to honor the thousands of dolphins slaughtered annually off the coastal waters of Taiji, Japan. 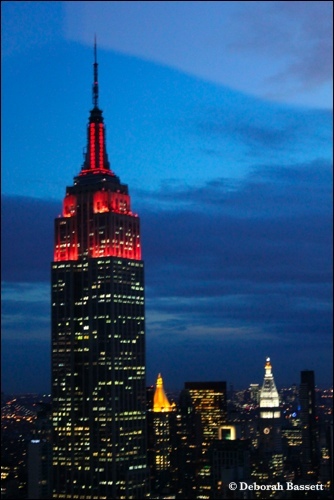 The color red was chosen to symbolically represent the bloodshed. "This ceremony is about reaching the people of Japan. It is a plea for their help in shutting down The Cove. Before the people of Japan can stop their government from supporting this annual slaughter, they need to know about it. We believe that the Japanese people love dolphins and that once they know what's happening, they will take action to stop it. It's really up to them." I am so honored to be here today with Ric O'Barry and Louie Psihoyos. I believe that The Cove is the best documentary ever made and seeing this film changed my life. I have been to Taiji, Japan three time since then and have witnessed firsthand the horrific slaughter of dolphins in the infamous killing cove. As someone who is half Japanese, this issue is incredibly important to me and I hope the Japanese people rise up and raise awareness within Japan about dangers of mercury tainted dolphin meat. 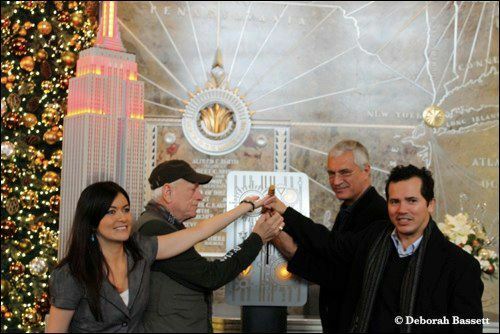 Leilani Munter, Richard O'Barry, Louie Psihoyos and John Leguizamo "flip the switch." "We still have a lot to do in The Cove. Today, they captured and slaughtered another 30 dolphins. It is important to keep it in the news. This lighting also honors the millions of people around the world -- most especially those in Japan -- who have joined us in our effort to raise awareness about the slaughters in Japan, The Faroe and the Solomon Islands, as well as the issues of global pollution and the overall health of our oceans worldwide." Munter, Leguizamo, Psihoyos and O'Barry atop The Empire State Building. For more information and to learn how you may take action, please visit: The Dolphin Project. More photos form the event may be viewed here. 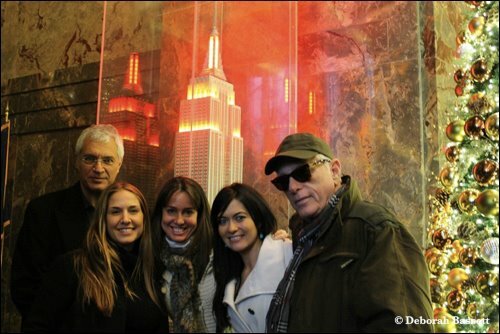 Cove Director Louie Psihoyos with Dolphin Project team members Deborah Bassett, Fonda Berosini, Leilani Munter and Ric O'Barry at The Empire State Building.